You know what it's like. You turn up to manage a new club and you don't know any of the players. Solution? Sign someone you've worked with before. 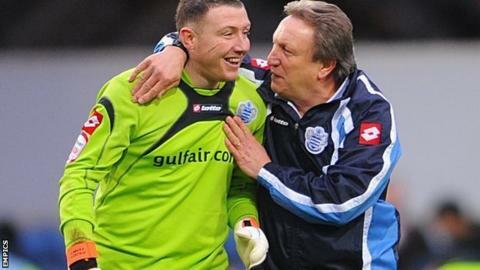 In homage to Rotherham boss Neil Warnock signing Paddy Kenny for the fifth time, BBC Sport looks at players that some managers just could not leave alone. It's September 1998 and Bury boss Neil Warnock takes a £10,000 punt on Bradford Park Avenue's 20-year-old goalkeeper Paddy Kenny. Little could anyone have known that it was the start of a near 20-year footballing love affair. Warnock soon moved on to Sheffield United and, after some three years apart, eventually returned to Gigg Lane to sign Kenny for the Blades in 2002. From there, Kenny made the move down to Loftus Road to join Warnock at QPR in 2010. It didn't last long for either and Warnock soon found himself back in Yorkshire with Leeds United where he was in need of a goalkeeper and called... you know who. Warnock then had a brief spell in charge of Crystal Palace where, bewilderingly, he didn't even attempt to sign the Republic of Ireland international. Thankfully, normal service has now been resumed. Brian Clough gave John McGovern some sage advice when he first happened across the Scotsman at Hartlepool in 1965. "Stand up straight, get your shoulders back and get your hair cut." McGovern clearly listened because Clough would go on to sign the midfielder for Derby, Leeds and, most famously, Nottingham Forest where the duo won two European Cups. They may not have had the success of McGovern and Clough but make no mistake this duo deserve recognition. Cook, now in charge of Portsmouth, met Beninese Boco when they were both playing for Accrington Stanley in 2005. By that stage a veteran, Cook soon moved into management with League of Ireland side Sligo Rovers and decided to bring in his old mate Boco - on three separate occasions. In February 2012 Cook was given a chance to manage in English football with Stanley and by August he had decided it was, once again, time for Boco. The pair were then reunited at Chesterfield in August 2014 and, most recently, at Pompey for a brief spell at the start of this season. Could Cook yet sign Boco, now 30, a seventh time? Don't rule it out as Boco's now back at Stanley. Perhaps no manager has shown such loyalty to players as Harry Redknapp. Redknapp worked with Sunderland striker Jermain Defoe at West Ham and signed him for both Portsmouth and Tottenham. Crouch and Redknapp first met when the latter was director of football at Pompey and then bumped into each other again down the south coast at Southampton before Redknapp re-signed him for Portsmouth and then Spurs. Croatia international Niko Kranjcar joined Redknapp at Fratton Park in 2006 before following him to White Hart Lane in 2009 and then having a couple of spells under the veteran manager at QPR. Arguably the best has been saved for last. For around 15 years these two were almost inseparable. Their paths first crossed at non-league Dover Athletic in 1995 before Taylor signed the midfielder for Gillingham in 1999. Taylor took over at Leicester City in 2000 and, with Neil Lennon having moved to Celtic, decided he needed more steel in midfield. He needed Lewis. From there Lewis followed Taylor's nomadic career to Hull, Brighton and finally Stevenage. Presumably much to Taylor's dismay, Lewis retired from playing in 2008, but not to fear Taylor brought him in as a coach at both Wycombe and Bradford.